Is the Paris Climate Agreement a Treaty? Is the Climate Change Agreement adopted in Paris by the 21st Conference of the Parties (COP21) a treaty? In other words, is it the type of international agreement to which the United States is a party only if the U.S. Senate ratifies it? It is indeed, as this post will show. Are the treaty’s emission-reduction and climate-finance “commitments” binding on the United States as a matter of international law? No. From day one, Obama administration negotiators pushed to make the treaty’s core elements non-binding to encourage “participation” and “ambition.” That is, nations are more likely to participate, and promise more than they can deliver, if there are no legal consequences for broken promises. The treaty’s emission-reduction and climate finance “commitments” might be compared to a non-binding Sense of Congress resolution, but for the fact that all Members of Congress can legitimately claim to represent people who elected them. In stark contrast, the 25,000 official delegates at COP21 do not represent peoples but rather “government, intergovernmental organisations, UN agencies, NGOs and civil society” (i.e., environmental pressure groups). Only a small minority of participating governments are full democracies. Also from day one, the Obama administration envisioned the treaty to be “politically binding.” That’s simply an obfuscatory way of saying that once adopted at COP21, the treaty will put political pressure on governments — first and foremost U.S. leaders after 2016 — to honor the treaty’s non-binding promises. COP 21 also demonstrates that political elites everywhere want to expand their power to rig energy markets and control trillions of dollars in energy-infrastructure investments — from now until 2050 and beyond. Those are not honorable motivations, and Obama’s successor should promptly submit the treaty to the Senate for its advice and consent. The real reason Obama insists the Paris agreement is not a treaty is obvious. Under the U.S. Constitution, the United States does not become a party to a treaty until “two thirds of Senators present” vote to ratify it (Article II, Section 2, Clause 2). There was no prospect of that happening even when Democrats held a majority of Senate seats. What should GOP leaders do? They should pass resolutions explaining why the Paris agreement is a treaty, why the President must therefore submit the agreement to the Senate for its advice and consent, and why until ratified the treaty is no more politically-binding on the people and Congress of the United States than the long lists of never-to-be-enacted proposals in presidential state of the union speeches. The concurrent resolution introduced by Sen. Mike Lee (R-Utah) and Rep. Mike Kelly (R-Penn.) is exactly the kind of action needed to frame the debate. House and Senate leaders should also use the power of the purse to block agency expenditures for activities related to the Paris treaty as long as the President works to circumvent the Constitution. Finally, congressional leaders should continue their efforts to overturn EPA’s so-called Clean Power Plan, which constitutes the largest part of the U.S. COP21 emission-reduction pledge (known in bureaucratic parlance as our Intended Nationally Determined Contribution, or INDC). Let’s now examine why, contrary to President Obama, the Paris climate agreement is a treaty. Administration officials offer two main rationales why the Paris agreement is not a treaty and, hence, need not be ratified. The Paris agreement’s emission-reduction requirements are not “binding” as a matter of international law. Rather, each country makes a non-enforceable promise to submit and implement its own goals (INDCs). The agreement just updates the UN Framework Convention on Climate Change (UNFCCC) of 1992, which the Senate ratified 98-0, so no additional ratification is required. Rationale (1) is obfuscatory flimflam, as my colleague Chris Horner explains. The administration wants us to believe “legally binding” is a defining criterion of “treaty.” It is not. 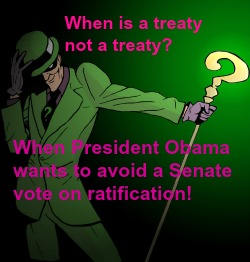 “Treaty” does not mean binding, and “non-binding” does not mean not a treaty. The most powerful (and relevant) evidence on this matter is none other than the granddaddy of all climate agreements, the UNFCCC. Nonetheless, because the treaty specifies no deliverables and no penalties for non-performance, the commitment to undertake such policies and measures is by all accounts non-binding, i.e., voluntary or aspirational. For example, recently declassified Clinton administration Kyoto Protocol planning documents describe UNFCCC emission-reduction goals as “non-binding” (see, e.g., pages 4 & 7 of this policy decision paper). Rationale (2) — that the Senate already ratified Paris when it ratified the UNFCCC — fails for two main reasons. First, the U.S. INDC violates the Executive Branch commitment on the basis of which the Senate gave its consent to ratify the UNFCCC. In 1992, the Democrat-controlled Senate consented to ratify the UNFCCC only on the condition that any subsequent emission-reduction targets and timetables would also be submitted to the Senate for its advice and consent. Heritage Foundation analyst Steve Groves excepts passages from the key documents. Here is a Q&A between the Senate Foreign Relations Committee and the first Bush administration. that a decision by the executive branch to reinterpret the Convention to apply legally binding targets and timetables for reducing emissions of greenhouse gases to the United States would alter the ‘‘shared understanding’’ of the Convention between the Senate and the executive branch and would therefore require the Senate’s advice and consent. Citing that passage, President Obama might claim that only “legally binding” targets and timetables would alter the “shared understanding” between the Senate and the executive branch. While it is undeniably true that an executive branch decision to reinterpret the UNFCCC as authority for legally-binding targets would alter the “shared understanding,” that is a separate point the Committee “further” notes. It is not a reformulation of the prior point, which is that targets and timetables must be submitted to the Senate for its advice and consent or the deal is off. Second, the Paris agreement is a treaty under official State Department criteria. (1) The extent to which the agreement involves commitments or risks affecting the nation as a whole. (2) Whether the agreement is intended to affect state laws. (3) Whether the agreement can be given effect without the enactment of subsequent legislation by the Congress. (4) Past U.S. practice as to similar agreements. (5) The preference of the Congress as to a particular type of agreement. (6) The degree of formality desired for an agreement. (7) The proposed duration of the agreement, the need for prompt conclusion of an agreement, and the desirability of concluding a routine or short-term agreement. (8) The general international practice as to similar agreements. Groves shows that the Paris agreement is a treaty under six of the State Department’s factors. Text in blue is from his Heritage study. The agreement certainly “involves commitments or risks affecting the U.S. as a whole.” The Administration has made clear that it intends to fulfill its mitigation commitments under the Paris Protocol by enforcing emissions standards through existing and new regulations on vehicles, buildings, power plants, and landfills. These are multi-sectoral, comprehensive, nationwide commitments that have no geographic limitation. The commitments made in the Paris Protocol will affect the entire nation, and therefore the protocol should be treated as a treaty. As contemplated, the Paris Protocol would include major financial commitments by the United States to assist developing countries in adapting to climate change. The committed amount is likely to be many billions of dollars — funds that must be authorized and appropriated by Congress. Since key provisions of the Paris Protocol cannot be given effect without the enactment of legislation, the protocol should be treated as a treaty. Major international environmental agreements are usually concluded as treaties and submitted to the Senate. . . . Since past U.S. practice has been to submit major international environmental agreements to the Senate, the protocol should be treated as a treaty. Congressional preference as to legal form of agreement. [The final] agreement covers a wide range of topics, including mitigation, adaptation, finance, technology transfer, capacity-building, transparency, implementation, compliance, and other matters. It is, by any measure, a “formal” agreement, and should therefore be treated as a treaty. There is clearly no need for “prompt conclusion” of the protocol (having been negotiated over several years’ time) and there is no desire to conclude it as a “routine or short-term agreement.” Since the duration of the protocol is effectively open-ended, and the protocol is not a “routine” or “short-term” agreement, it should be treated as a treaty. N.B. The Paris Agreement’s long duration necessarily increases the “commitments or risks affecting the United States as a whole” — the first factor determining whether an agreement is a treaty. Under Article 3 of the Paris agreement, “The efforts of all Parties will represent a progression over time.” Under Article 4, “Each Party’s successive nationally determined contribution will represent a progression beyond the Party’s then current nationally determined contribution and reflect its highest possible ambition” (Article 4). No such “ratchet mechanism” exists in either the UNFCCC or the Kyoto Protocol, observes climate policy historian Rupert Darwall. In terms of commitment and risk, the Paris agreement potentially exceeds both the UNFCCC and the Kyoto Protocol, which nobody disputes are treaties. Although not discussed by Groves, the Paris agreement is arguably a treaty under the two other State Department factors: intended to affect State laws and general international practice. For the Obama administration, a major purpose of the Paris agreement is to harden EPA’s Clean Power Plan (CPP) from political and legal attack. The CPP, which requires States to reduce electric power-sector carbon dioxide (CO2) emissions 32% by 2030, accounts for the single largest component of the U.S. INDC. Obama is betting the next president, future Congresses, and even courts won’t dare repeal or overturn the rule because, thanks to the Paris treaty, the CPP is an integral part of something much bigger we have promised to the world. U.S. climate negotiator Todd Stern invokes the Paris agreement to defend the CPP in an affidavit he recently submitted to the D.C. Circuit Court of Appeals. The court, he argues, should not put a stay on the CPP while the rule is litigated on the merits. Staying the rule, he warns, could undermine other countries’ emission-reduction commitments under the Paris agreement by raising doubts about the seriousness of our own. To comply with the CPP, States without renewable energy mandates or tax incentives will have to adopt them; some with such policies will have to increase them. In many States, grid operators will have to replace traditional “economic dispatch” with “low-carbon dispatch,” giving priority to generating units with the lowest emissions rather than those with the lowest cost. Many States will adopt new or more aggressive electricity demand-reduction programs. Many States will have to adopt or expand carbon cap-and-trade program. All such changes are legislative in nature. Insofar as the Paris agreement advances the political and legal prospects of federal regulation requiring States to revise their laws, it also affects State laws. This result is intended by administration officials including the top climate negotiator. Finally, “general international practice as to similar agreements” stamps the Paris agreement as a treaty. Like the UNFCCC and the Kyoto Protocol, the Paris agreement was negotiated and adopted by the “Conferences of the Parties.” It is obviously the successor agreement to both UNFCCC and Kyoto. Nations become Parties to it in the exact same way — by depositing “instruments of ratification, acceptance, approval, or accession.” Like UNFCCC, the Paris agreement’s emission-reduction requirements are non-binding. Like Kyoto, the Paris agreement is based on targets and timetables (in the form of INDCs). So by all eight of the State Department’s treaty-identifying criteria, the Paris agreement is a treaty.